Humans need water to survive because water re hydrates and rejuvenates vital organs of our body and mind. Just like humans, our plants as well are living organisms and require same treatment for effective growth all year round through the process of watering it. The best time to water lawn during hot weather is a question how to approach keeping your grasses alive. If you are not careful this deed could turn sour especially when done at the wrong time as this could lead to waste of water and plant dehydration. No wonder the coolest time of the day when the environment is moist is best for keeping your lawn alive and evergreen. Proper lawn maintenance does not only beautify the home but also adds elegance and style to giving our home that desired look. Just as the saying goes, “nothing good comes easy” clearly explains why we encounter difficulty in keeping our lawn evergreen especially during extreme hot weather. Watering at early hours of the Morning – The best approach is watering at the break of dawn. This is the best time to water lawn in hot weather and even in different climate such as the dry and cold climate. Mornings are best and most effective periods because evaporation at this time is low due to cooler temperatures and water is never wasted since all water sprayed focuses on the target grass as there is less wind to help it deviate from target. Do not water at mid day – The reason you do not water when the sun is high, is simply because there is too much evaporation. A lot of water will be lost before it even gets into the soil. Do not water at night – A series of studies bring us to the fact that even though temperatures are cooler at nights, it is never the best time to water lawn in hot weather including other climates such as dry, cold, or rainy as this could be hazardous to it.Watering at night is to the detriment of the lawn because grasses do not readily absorb water at night due to a continuous temperature drop. This could lead to having stacks of stagnant water in your lawn, which in turn yield fungal growth thereby causing harm to your lawn. 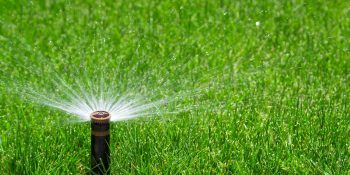 In addition to knowing the best time to water lawn in hot weather, it is also important to note simple facts which encourage a healthy growth of your lawn. During summer, a simple approach to watering your lawn is never to over water it. Yes, the soil and climate is dry, but this does not necessarily calls for too much water. A little watering will do to keep your lawn green and help stay away from fungal outbreaks. Thanks for sharing nice information! Lawn and garden maintenance at time intervals makes your home look great. lawn mowers, trimmers, blowers etc. tools are very useful for lawn maintenance.